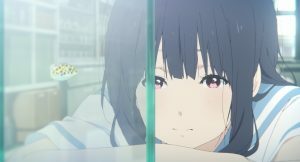 Kyoto Animation’s Liz and the Blue Bird anime film is coming to theaters throughout the U.S. on November 9, with select areas showing the feature even earlier. Ahead of that, ELEVEN ARTS Anime Studio shared the first part of a behind-the-scenes video that looks at the making of the movie with director Naoko Yamada (A Silent Voice). You can purchase tickets for Liz and the Blue Bird now. Mizore Yoroizuka plays the oboe, and Nozomi Kasaki plays the flute in Kita Uji High School concert band. As seniors, this will be their last competition together, and the selected piece “Liz and the Blue Bird” features a duet for the oboe and flute. “This piece reminds me of us.” Nozomi says cheerfully, enjoying the solo, while Mizore’s usual happiness to play with Nozomi is tinged with the dread of their inevitable parting. By all accounts the girls are best friends, but the oboe and flute duet sounds disjointed, as if underscoring a growing distance between them. Talk of college creates a small rift in their relationship, as the story evolves to reveal a shocking and emotional conclusion.